'Ceramics Conversations' focuses on popular ceramics made in France (Vallauris, Annecy) and Germany, between the 1950s and the 70s — in studios, small workshops and factories — in a democratic (and commercially viable) move to take artistic MODERNITY into every home, through ceramics. Challenging aesthetic hierarchies, the exhibition stages 'conversations' between ceramic objects; to invite us to engage with, and explore, their MATERIALITY as a basis for appreciation. The exhibition focuses on 'popular' ceramics, produced in France and Germany, from the 1950s down to the 1970s, in the optimistic spirit of post-war reconstruction. It also includes examples of earlier ceramics (Japanese, Art Nouveau, Art Déco, Bauhaus, etc.) to situate the works in the ceramic world history from which they are excluded. During the post-war decades, in Germany, under the impetus of the BAUHAUS, many ceramic studios and factories produced an unprecedented range of 'modern' and 'contemporary' works, alongside more traditional ones, in a move to make modern, 'experimental' works affordable by adapting modes of production that made them economically viable. [One problem with 'Art' ceramics, during the late 19th and early 20th centuries, is that even when serially produced, the still high cost of production meant they were only affordable to a minority. During the 1920s, CAB (Céramiques d'Art de Bordeaux) and many small 'ateliers' in Puisaye and elsewhere, aimed to produce works which were affordable to all. The resulting standardisation of production (to lower the costs of production), however, led to uniformisation of forms and glazes. This process, however, can also be observed in the stereotypical studio pots that came out of the Leach revival; to this day]. From top to bottom: 1: Le Cyclope, Annecy; 2-3: Vallauris, unidentified workshops/factories. 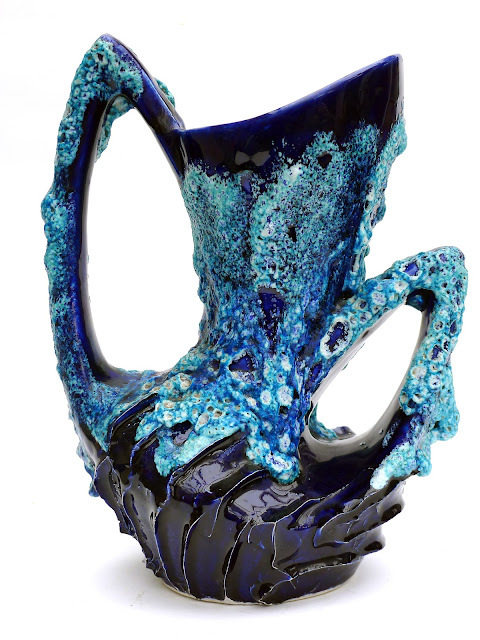 The blue glaze is probably by Marino Le Vaucour. To achieve economic viability, both studios and factories had to standardise production. This, inevitably, resulted in discrepancies in standards between items of the same batch as well as from different batches. Today, the challenge for the discriminating collector consists in sifting out the good from the mediocre, by critically engaging with the 'materiality' of the works, instead of relying primarily on marks, undiscriminately. It should be noted that what we may regard, today, as the more artistically ambitious works, may not have been more expensive than the more conventional designs produced by manufacturers to supply goods for the mass market. What is clear is that the enlightened design policy of certain manufacturers made 'Modernity' affordable to a section of the public that wanted it or were receptive to it; it does not mean, however, that this Modernity spread into every home, as the Bauhaus had willed. Looking statistically at the mass of ceramics produced during that period (and today offered for sale on ebay), one can only conclude that quality pieces represent the tip of the iceberg in a sea of commercial mass-produced mediocrity. The same can be said of works produced in Vallauris, during the same period, where a standard, ready made streaky glaze was used by different manufacturers — either on traditional or on 'free form' items — to replace the traditional 'terres vernissés' pots. 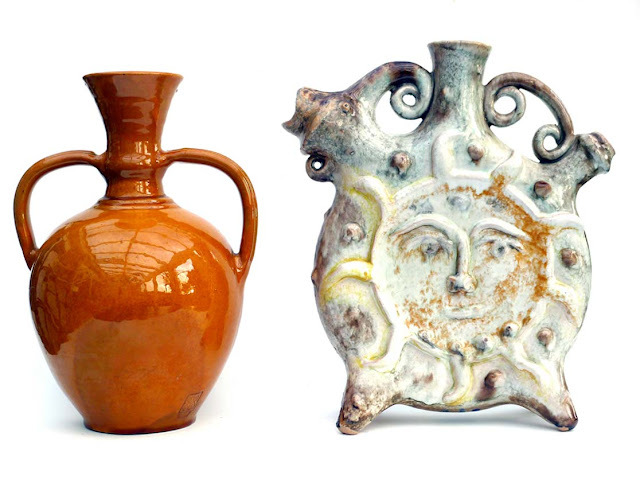 These came to and continues to symbolize Vallauris ceramics in the public mind, at car boot sales, brocantes, etc. A cursory statistical examination of German works offered for sale in the UK and in France, not just on ebay but in second-hand and antiques shops as well, suggests that the best pieces of WGP and Vallauris were not exported to those countries. In Britain, the ceramic industry's demise resulted from the incapacity of the larger firms to renew themselves, and by the inexorable influx of cheap products from Portugal,Turkey, then from the Far East, which provided cheap, banal ceramics. Before that, the 'studio' ceramics revival led by Bernard Leach, claimed the field of 'art' ceramics for itself; rejecting 'industrial' ceramics and experiments with colour glazes (by Dalpayrat and others) as a deviation from 'true' ceramics. The limited range of 20th century British factory-produced ceramics showcased in the V & A suggests that production by the largest firms consisted predominantly of more or less conventionally decorated table ware (at best with 'Festival of Britain' type decoration); and that the vase may not have held the same iconic status as on the continent. Poole Pottery were probably the more consistent producers of modern ceramic designs in post-war Britain; alongside smaller potteries dotted around the country: Cinque Port, Troika (1963-83), Tremaen Pottery (1965-88), etc. An interesting experiment was conducted briefly at the Langley factory (Nottinghamshire), around 1931 [when Charles A.M. Oakes was appointed managing director and introduced a modern tunnel kiln], and art graduates were invited to produce new designs, on a part-time basis. A hand-thrown and turned on the lathe (surprisingly not featured in the Langley monograph by John and Jennifer Giblin) stand out by their quality of form and glaze above the production of the company. Here a modernistic form, decorated with an experimental glazes (with some ambitious attempts at crystallisation) give us a glimpse of an isolated and short-lived attempt at introducing ceramic modernity among an otherwise stylistically conventional range. An unwritten chapter in the history of British industrial ceramics of the first half of the XXth century shows that 's attempts to introduce modernity in their range shows that a few scattered attempts at creating a 'studio range' ended in failure; unable to compete with the likes of 'Chan ware' produced by Douton in Lambeth. Wardle Art Pottery only lasted from 1902 to 1909, and E. Roddy & Cº (1925-28) in Burslem, tried to produce art ware that, by then, were stylistically out of date; compare with the bright glazes developed by Pilkington at their Royal Lancastrian works. Ninety years on, it is important to situate those popular experiments from France and Germany in 20th century ceramic history, and challenge the arbitrary divide between CRAFT and INDUSTRY, inherited from William Morris, Ruskin and the Arts & Craft Movement; and later reiterated by Bernard each, against Herbert Read's suggestions in Art and Industry (1931) that 'archaic' crafts modes of production, of the type promoted by Leach, were now obsolete for ceramics, and should give way to industrial production. In Germany, the BAUHAUS inspired many studios and factories to develop economically viable and sustainable, hybrids modes of production, which combined craft and design skills with new technologies and industrial or semi-industrial modes of production. These new, hybrid modes of production generated new aesthetic materialities and values; some distinct from, others akin to those of studio works. In the best cases — when craft skills were integrated in the production process (i.e. were allowed to manifest themselves, alongside design) — they gave factory-made ceramics an experimental look traditionally associated with studio works. The pairing of a FORM and a GLAZE designer, complemented by a highly skilled work force, ensured that serially produced works had or approached some of the quality of studio works. Unlike the 'royal' or aristocratic bone china pastiches tea, coffee and dinner sets produced in Britain, or the Festival of Britain-inspired illustrative 'modern' equivalent, firms like KPM, Furstenberg, Sgrafo, Arzberg and others, in Germany — alongside their 'traditional', neo-classical range — went on producing porcelain works which expressed the 20th century. The exhibition focuses on CERAMIC MATERIALITY and highlights COOPERATIVE forms of AUTHORSHIP (not on stars and celebrities working with archaic 'studio' modes of production, for an exclusive and rarefied group of collectors). Recent changes in attributions — from Roth to Marei Keramik — invite us to take a closer look at the objects themselves: at their 'aesthetic materiality'; rather than merely rely on signatures and fashions to shape our perception and appreciation/evaluation of the works. Whether a vase was made by Roth or Marei is not important in itself. Appreciating the discrete qualities of a work (and the coherence of a body of works) — what makes it different from others — is. Equally important is the capacity to recognize inferior works for what they are, and to do so knowingly, on the basis of objective criteria. The uncertainties in securing attributions highlights the wisdom of accepting to live (at least for a while) with a history of ceramics without names — and an imprecise chronology — focusing on the language of forms and glazes and on the making & production processes. This new MAPPING OUT of the field will encourage us to discover new relations between the works; based on our individual perceptions and on personal reflections, rather than on the uncritical acceptance of conventional values, bi-passing fashions, and rejecting arbitrary aesthetic hierarchies. New qualities will become apparent, as we identify relevant criteria and begin a critical re-evaluation of the works. 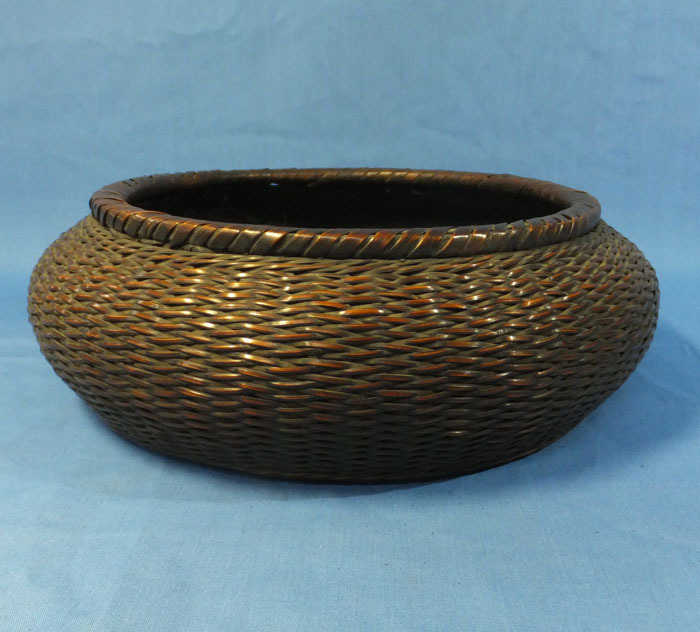 The words 'stunning' or 'rare' used by naive collectors and opportunist ebay sellers to describe 'ordinary', banal and unremarkable mass-produced pots should be avoided; if a modicum of critical sense is to arise and take effect. Without it, the field is not likely to be ever taken seriously, and will remain marginalised by the wider ceramic community, museums and galleries. Departing from the way museums and collections display works — according to specific typologies and taxonomies (classification systems), by author, style, period, country of origin, type of objects/functions, etc. 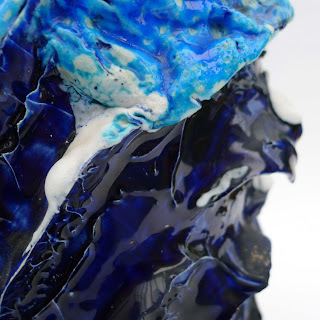 — 'CERAMIC CONVERSATIONS' propose a free exploration of ceramics based on creative, 'deregulated' looking. The intention is to open up and discover new perspectives rather than to merely verify what we know already. Left: Blanc de Chine vase. Porcelain. 18th century. H.: 27 cm. Right: Atelier of 'Louis Giraud' (Vallauris). Vase. 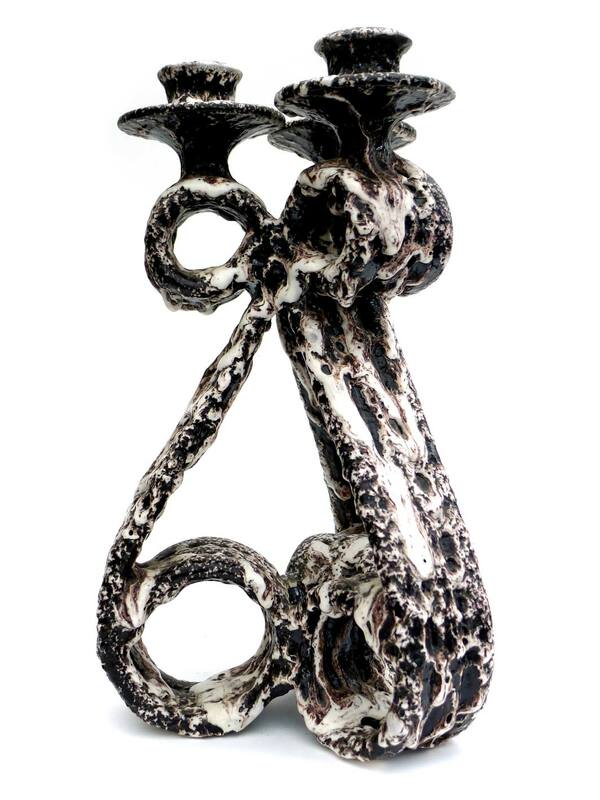 Hand-thrown, then reassembled 'Forme Libre', stoneware, decorated with white and grey lava glaze. Early 1950s. H.: 31.5 cm. Probably by Alexandre Kostanda (1921-2007), who ran Giraud's studio from 1949 to 1953, when he left to set up his own. [Attribution based on the formal similarity with pitchers he produced in his own studio after 1953]. Form & Function: Towards a multi-functional aesthetics. 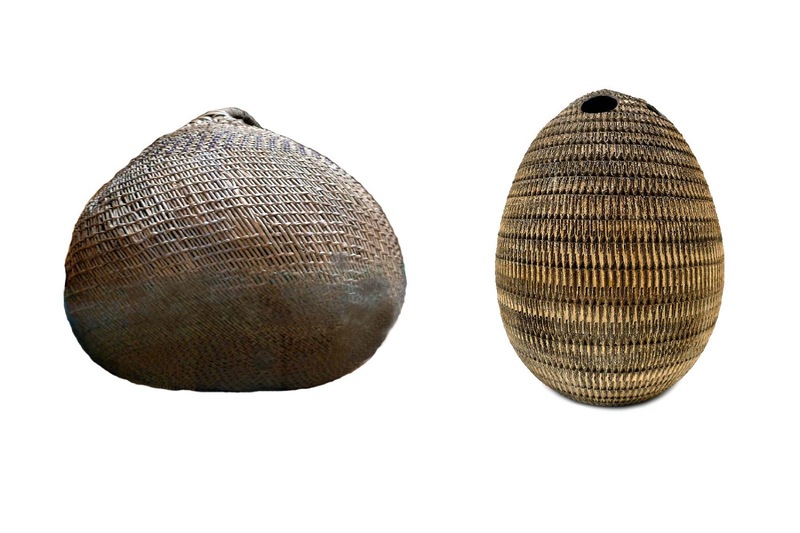 It has been suggested (by anthropologists and by archaeologists) that pottery was 'invented' or 'discovered', by chance; when a woven basket, coated with clay on the inside (to hold water), was inadvertently left near a fire and burnt; leaving a fragile clay vessel standing in its place, with the pattern of the basket impressed in the clay. 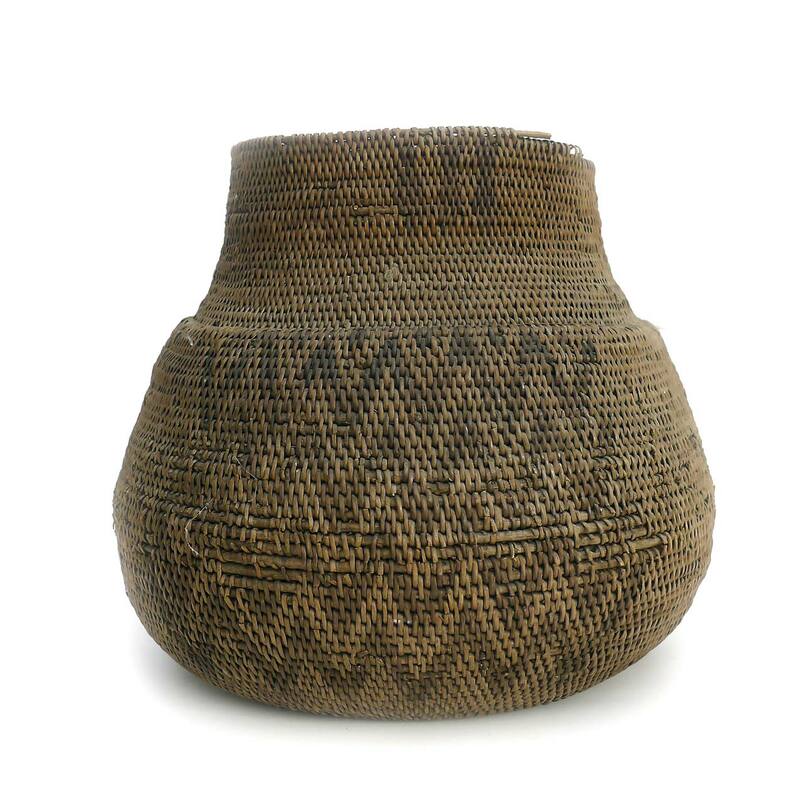 This story is also used to explain the traces of decorative basket patterns imprinted on early pottery. We will never know the truth, but can consider the story as relaying a plausible, poetic hypothesis. Although the thin crust of baked clay could not have been functional, without the supporting structure of the basket, it may have inspired someone to pursue the experiment till it became so. Unlike with the basket, where the weaving method generated simultaneously both the pattern and the structure [the pattern is the structure] — and any irregularities in the pattern (i.e. any deviations from geometric perfection) arose from human variations in the execution (i.e. from human limitations) — the more complex pattern on the vase was deliberately planned and carried out for decorative purposes only. In the vase, some irregularities do occur, however — subtle and almost imperceptible — in the micro variations between each of the maker's marks: through the dizzying repetition of pressing the tool, cutting and removing bits of clay: to create as regular and as complex a pattern as could be achieved by human hands; leaving the distinctive mark of the potter's 'hand-writing'. Taking a considerable amount of time and care — more than was necessary (but who is to say what is necessary in this case, without running the risk of imposing dogmas, such as 'Ornament is crime' ?) — and applying a high level of art (in the design) and craft skills (in the execution), in order to produce a richer and more complex pattern, highlights one feature of the 'aesthetic' dimension. The above juxtapposition may seem, at first, a crime of lèse-ceramics-majesté to some. The intention, however, is to compare two aesthetic approaches to painted decoration, within two ceramic modes of production; two types of ceramics, which are arbitrarily kept apart ('segregated') in museums and in ceramic histories, and have never been considered in relation to each other up to now. Craft into industry: To achieve the pattern of concentric circles, on the plate (right), a first set of pigments was applied in fluid form, over a red glaze, probably with a brush. A second set of pigments was sprinkled in powder forms: on a rotating wheel, to allow particles of oxides to fall and remain suspended in the other glaze layers, without fully dissolving into them. The outcome: two legitimate ways of decorating a plate; corresponding to two different artistic styles, two philosophies of life, two modes of production, two artistic ambitions… These do not have to be at war with each other; for, unlike Leach argued, in a pluralist world, they are not fundamentally incompatible, but only express different aesthetics, different modes of productions and distribution… two facets of contemporary life. Both plates (above) use slip decoration. 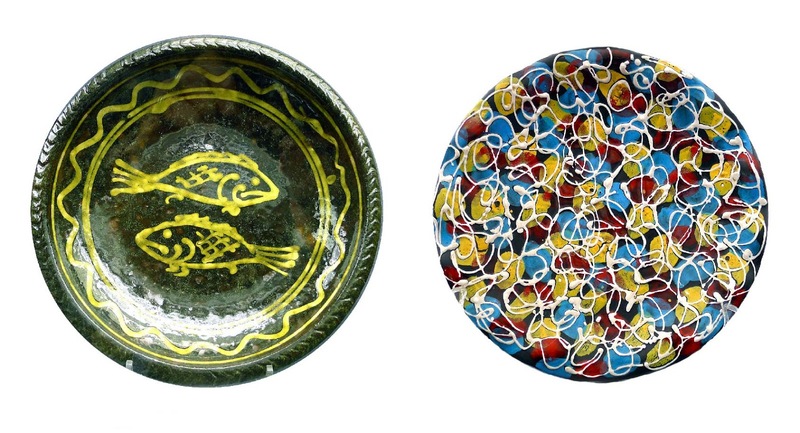 Whereas on the left, the potter imitates country slipware of previous centuries (in the pursuit of what Peter Dormer termed a 'romantic idyll'); on the right, the combination of bright colored blobs dabbed on a black background, then over-layered with a trail of white slip, have produced a dynamic urban hybrid: half-way between Jackson Pollock and cake decoration — in an anonymous Italian factory. Transcending dualisms, this provocative (iconoclastic to some) encounter suggests that both can be appreciated for their respective qualities; provided that we open our minds to the 'worlds' of the 'works' (in the spirit of philosopher Paul Ricoeur). This requires extending the criteria we use for evaluating ceramics. The gourd originally and still used, in some countries as a container for liquid or powdered substances, inspired ceramic forms in China, Korea and Japan; then, by imitation, 1000 years or so later, in Europe. Around 1900 the Martin brothers produced some distinctive small vases inspired by gourde shapes, which they decorated with scarifications and light glazes. 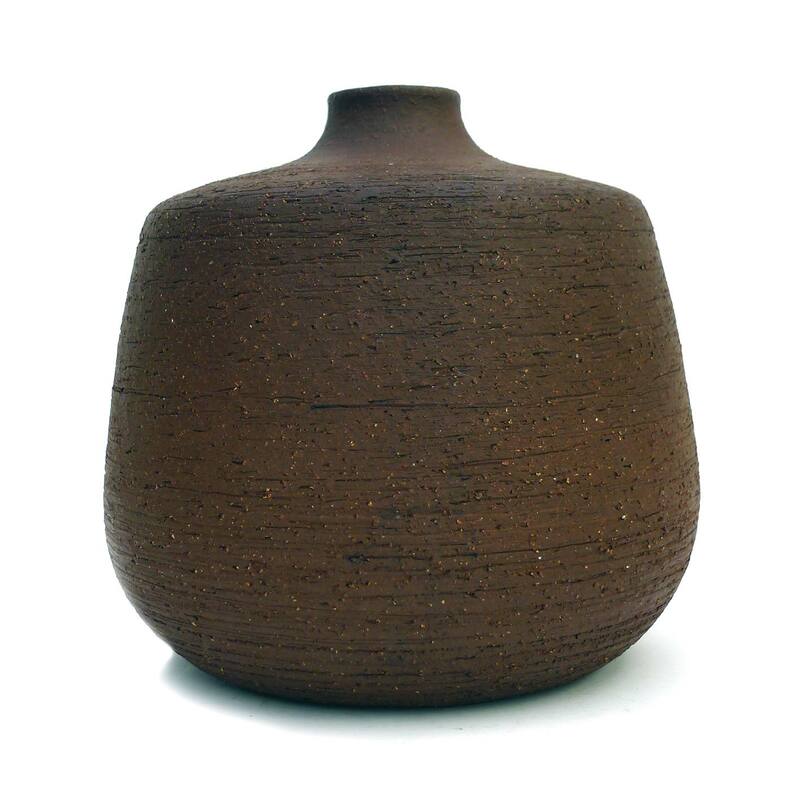 In France Jean Carriès and Dalpayrat used the gourd, inspired by traditional Japanese stoneware they saw at the Paris International exhibitions. 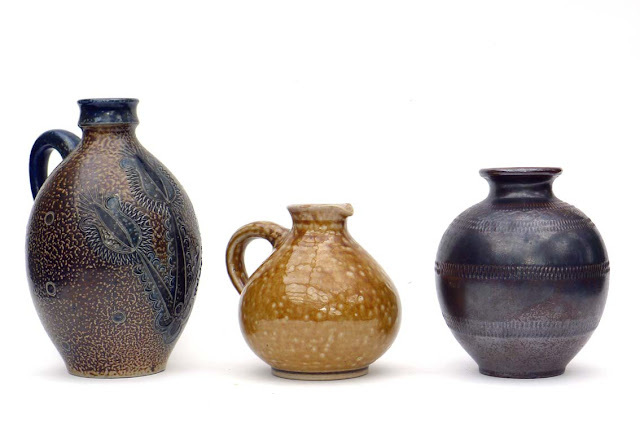 The stoneware potters of Puisaye, Cythère, Grès de Pierrefonds, Gréber, Méténier, Petit Massé and others followed suit. In this conversation two stylistically diverse interpretations of the gourde motif demonstrate continuity in diversity… in a studio and an industrial context. The exhibition challenges current accounts of 20th century Ceramic History, and their emphasis on exclusive studio ceramics (premissed on individual 'self-' [as opposed to 'collective'] artistic expression and authorship, and on the elitist segregation and classification of ceramics according to their alleged importance and significance in the 20th century) and proposes a more inclusive perspective, and an extension of the ceramic field on more democratic principles. This 'extended' field brings together studio, industrial and other popular (non elitist) ceramic practices, which set out to relay the spirit of modernity to a wider public. These practices chose the 'commercial' route [which enabled a significant number of artists, designers, craftsmen and women to earn a living] over the 'elitist' path, which led to the production of rarefied, fetishized commodities, with their aesthetic value and cultural significance indexed on high auction prices. The exhibition suggests that there are other ways of measuring value and significance, based on wider sets of criteria. During the last quarter of the 19th century European ceramicists strove to rediscover the lost formulae of classical Chinese 'sang de boeuf' glazes. Once the secret was rediscovered, more ambitious ceramicists, like Dalpayrat, set themselves the challenge of producing more complex reactions from copper oxide, to combine more complex colors and thick textures, which an early commentator compared to a 'flow of burning lava' [quoted by Horst Makus (1998):25]. Given the lack of systematic knowledge about the chemistry of glazes at that time, extensive research and experiments had to be conducted at industrial or research plants (like the laboratory of the Manufacture de Sèvres, in France), that had the facilities, technology, staff and financial resources to fund them. This is why individual artists-ceramicists like Dalpayrat had to find industrial partners, to develop their work, and produce, in return, ceramics suitable for serial production, in factory conditions, in order to make the investment in research economically viable. In these conditions, as can be seen in the works illustrated in Horst Makus' monograph on Dalpayrat ((See Horst Makust, Adrien Dalpayrat, Céramique Française de l'Art Nouveau, Stuttgard, Arnoldsche, 1998), the artist's main body of works consisted mostly of serially produced objects, that were necessarily less free and experimental [the processes having to be controlled in order to be reproducible] than if they had been individually produced as 'one offs', in a studio, exploiting 'accidents' and the 'gift of chance'; rather than trying to produce works in series. Given the technological means and resources required, total experimentation (for simple economic reasons) was simply not compatible with working as an isolated, unassisted studio potter. 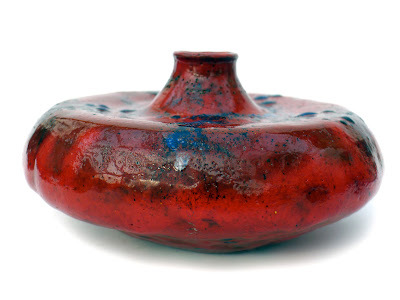 Artists who, like Jean Carriès, did — away from urban centers, in Puisaye — had to forego the complex glaze chemistry that led to bright colors and explore other properties of glazes. The stoneware potters of Puisaye were subjected to and assumed the same constraints. In La Borne, Vassil Ivanoff's pursuit of flambé reds produced wild/'fauves' earthy reds, unlike the bright, polished glazes achieved at Sèvres. These two experimental works from the early to mid 1890s, show the visual transmutations of copper oxide in the presence of chemical catalysts, in a reductive atmosphere, in a transitional stage, from red to blue. 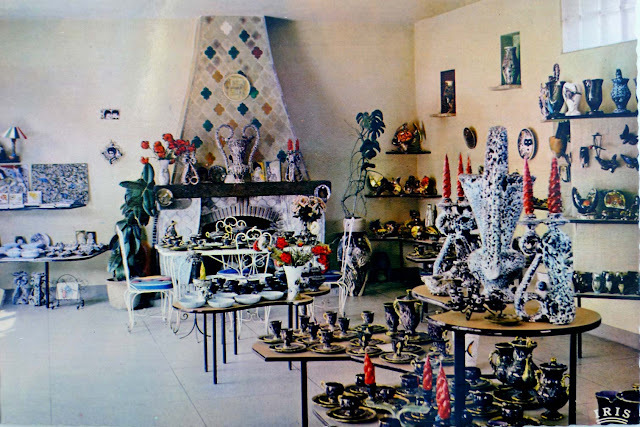 However, whereas Dalpayrat produced work for the luxury market, in Vallauris, Annecy and Germany, over half a century later, studios, industrial or semi-industrial plants set out to produce modern ceramics for a wider public, at affordable prices. The Bauhaus had a significant impact on ceramics, by encouraging students to develop designs suitable for mass production. This ethos stood at the opposite end of the fundamentally elitist (even if unintentionally so) contemporary ceramic revival instigated in Britain by Bernard Leach; which turned its back on industry and chose the model of the country potter of previous centuries as its mode of production, and 12th century Korean and 14th century Chinese works as its exemplars. Unfortunately, this contrived philosophy did not benefit the majority or deliver its promise (good pots for all). On the one hand, it inspired a mass of cloned, formulaic, and anachronistic hand-thrown pots which shared the same dullness as some of the industrially mass-produced works. On the other, it produced fetishized commodities imbued with the aura of the maker/master (which conferred upon him/her high symbolic value at the expense of their function as bowls, picher, cider flagond, etc.). Only affordable to a few, they betrayed the spirit of the originals [as can be verified by reading Soetsu Yanagi's book The Unknown Craftsman which inspired the revival]. In spite of its archaic-elitist nature and its shortcomings, the model persists in craft ceramics. The Halle vase (above, centre), designed in 1931 by Bauhaus student turned teacher Marguerite Friedlaender-Vildehain, reinterprets the neo-classical porcelain vase of Carl-Friedrich Schinkel, by stretching it upward; reducing the lip to a minimum and increasing the height of the foot. This simple structural intervention confers upon the vase a vertical dynamism. 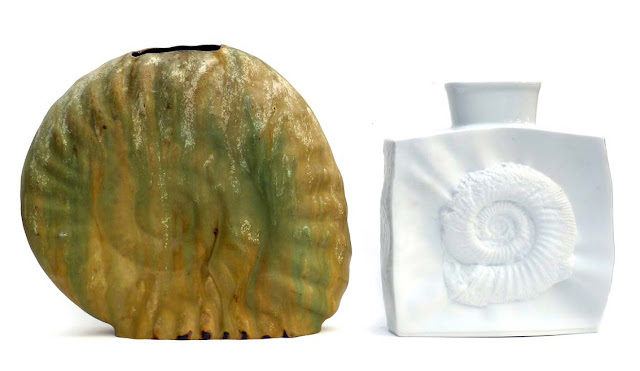 By contrast the vase designed in 1937, by Walter Nietzsche for Furstenberg (above right), more conventionally emphasises the body of the vase; giving it an overall sense of stability and weight. 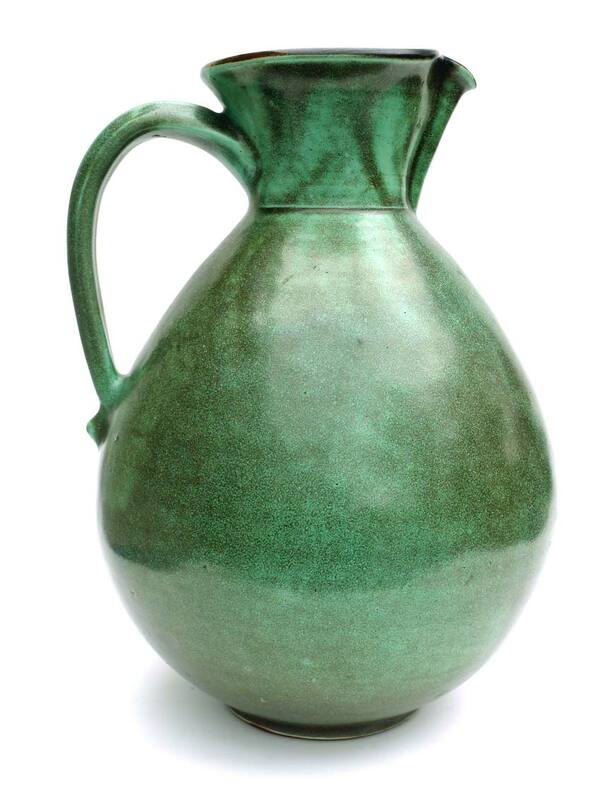 This 'krug (jug) vase' (above) was hand-thrown at the Margarethenhöhe Keramische Werksatt, during the 1930s — when Leßmann was in charge of design and production (where he remained till 1944, when Walburga Külz took over, till 1952) — not with the intention of producing an exclusive, one-off piece, but to retain a 'hand made' quality in a ceramic object intended for domestic use in an 'average' home. The cost of production combined with good management enabled the craft model adopted at the Margarethenhöhe workshop to remain economically viable, and has lasted to this day, with some modifications, under the direction of Korean-born potter Young-Jae-Lee. The two vases (above) from the same studio illustrates the move towards organic forms, which took place, in Germany, at the beginning of the 50s. 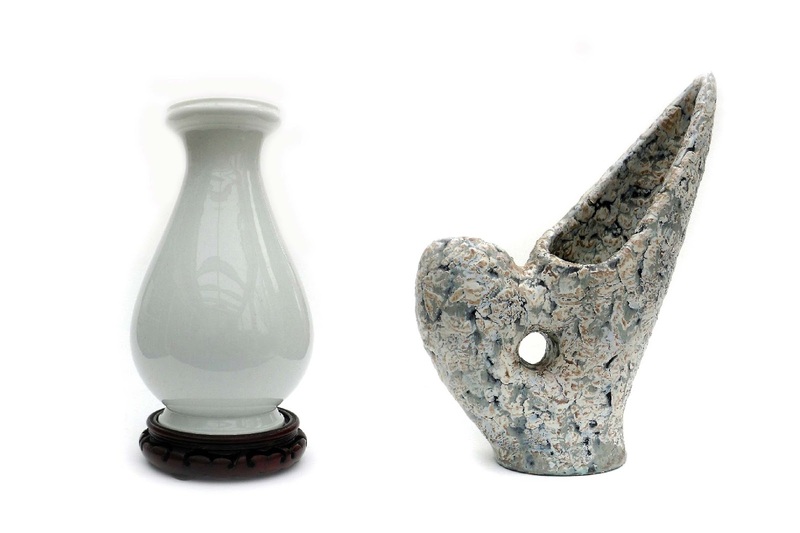 In the green vase, the formal components have been reduced from four to two: foot and body. 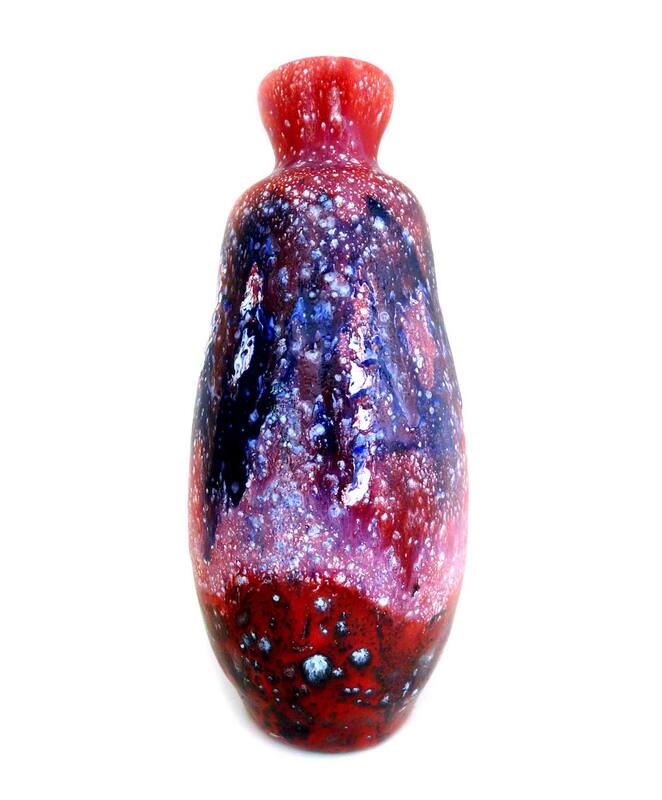 The neck and lip have been absorbed in the organic body of the vase. 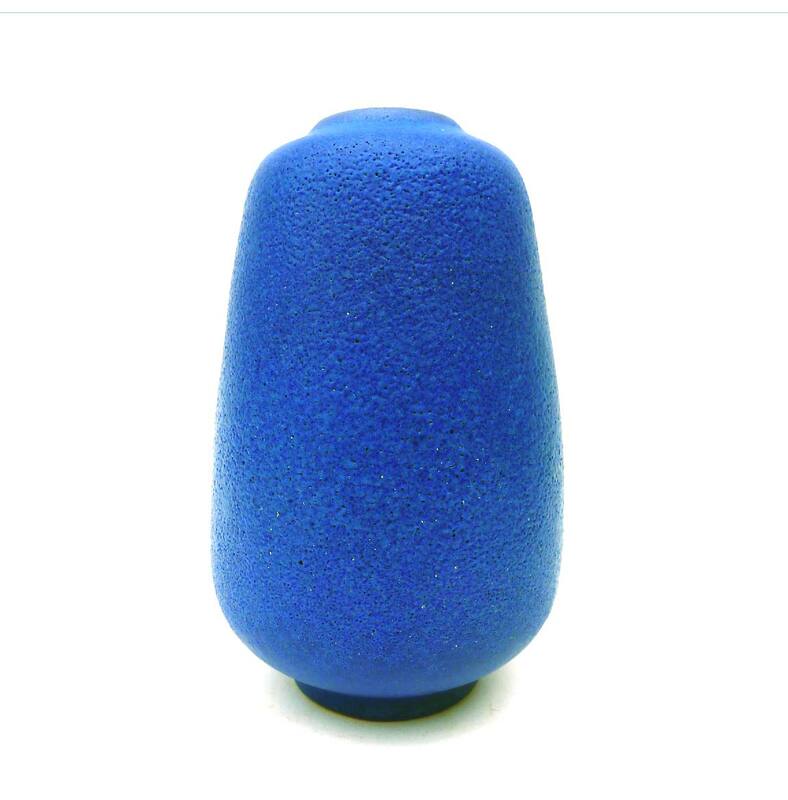 This new synthesis of the vase (different from the more emphatically articulated geometric Halle vase) was adopted by many studio potters and ateliers throughout the 50s: Hermann Grothe, Walburga Külz, Theodor Bogler, Ursula Fesca, F. Glatzle, Rudi Stahl, Paul Eydner, etc. to name a few, and became a distinctive feature of the period, alongside (and probably in response to) the introduction of streamlining from the USA. Margarethenhöhe Keramische Werksatt: Johannes Leßmann, 1930s (left). Walburga Külz, early 50s (right). In addition to heading the ceramic workshop at Maria Laach, Bogler became prior of the abbey; an ideal position to produce ceramics imbued with spirituality. Wim Muhlendyck set up his studio in 1931 in the Westerwäld pottery town of Höhr-Grenzhausen (home of Dümler & Breiden, Eckhardt & Engler, Marzi & Remi, Merkelbach, Sgrafo Modern, Steuler, Wick-Werke and Rudi Stahl, as well as of a Ceramic University), where he produced works which interpreted the local tradition; combining it, at times, with other traditions; all in a contemporary spirit. 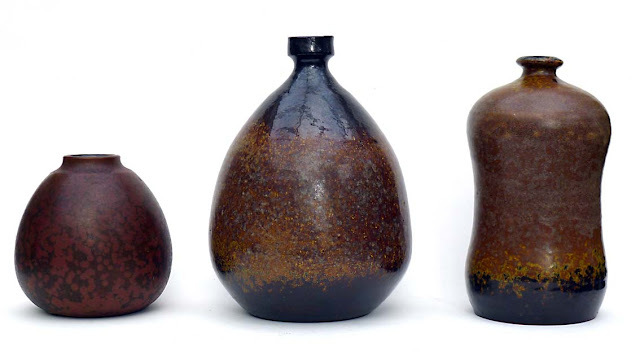 Wim Muhlendyck, Three vases (1950s-60s). 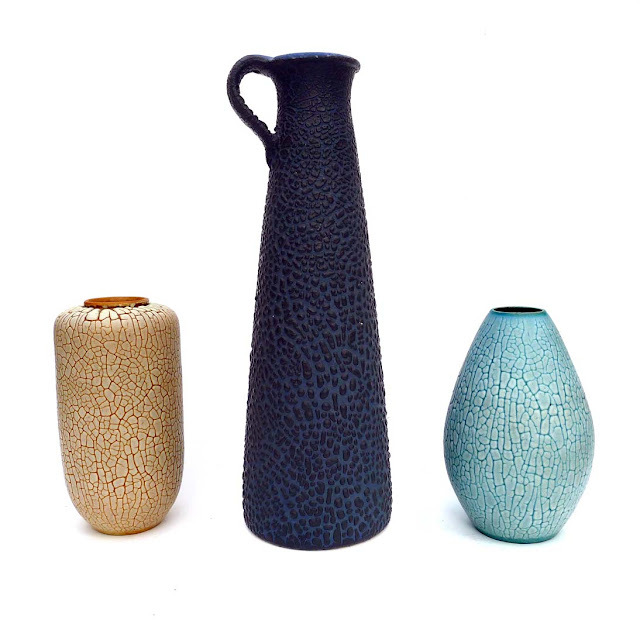 Elmar and Elke Kubicek, Three vases. Stoneware. 1960s. Remark: In their respective ateliers, these studio potters produced hand-thrown works in series, for a wide public; demonstrating that craft modes of production could be economically viable and, alongside factories, produce quality ceramics at affordable prices. This, of course, meant that the works were made 'for' people and not as egotistical forms of self-expression. Expression here coincided with empathy with new forms and processes, and with the satisfaction of producing objects that people wanted. As a result of serial production, quality could vary from piece to piece. Rudi Stahl, Vase. Unglazed stoneware. 1960s. German ceramics of the post-war period disproved Herbert Read's argument, presented in Art and Industry*, that craft modes of production were obsolete, and that ceramics should evolve new industrial models, away and distinct from craft. German manufacturers proved that building craft into industry was nor only possible, but also economically viable, and could achieve the 'vitality' that Read regarded as essential. * (Art and Industry, 2nd 1944, p. 160). Many factories, like Marei Keramik, achieved a new vitality by placing a stronger emphasis on glazes (over form). Lava glazes had the effect of attenuating the machine look and geometric perfection of slip cast and moulded vases, and emancipated glazes from their subservient role as surface decoration. Marei, Vase. Form 4302. 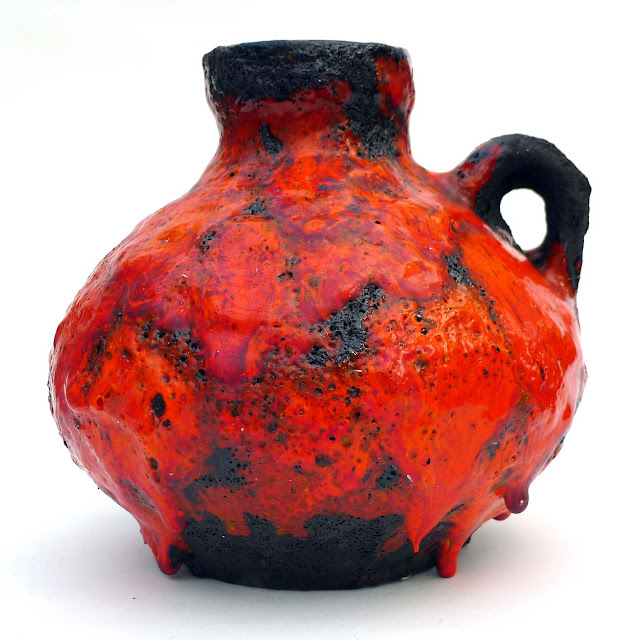 Stoneware, decorated with thick red lava. Whatever factory produced it (Roth or Marei), this vase stands among the highest achievements, among German manufacturers of lava glazes. In perfect harmony with the designed form of the vase, the thick rich lava glaze — skilfully applied by anonymous hands — transcends the limitations associated with mass production and standardisation. The effect of different glazes on the same vase (form) is illustrated in the exhibition. This is a rare achievement, however, for, more often than not, batch production introduced a degree of uniformity; the consequence of standardisation and repetition which, at times, reduced the creative scope of the glazier to a minimum. For the discriminating collector, the challenge is to find a 'good' instance of a glaze, among the hundreds or thousands that were applied over several batches. 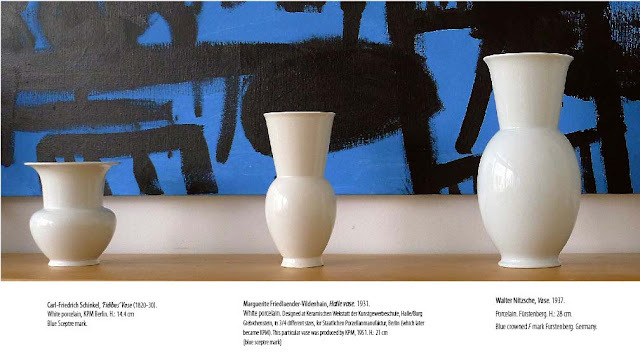 Calling on first class ceramic designers Kurt Tschörner (form) and Otto Gerhaz (glaze) [below left], the firm Ruscha produced some iconic vases (313, 315, 333) in which form and glaze achieved a remarkable, harmonious equilibrium. 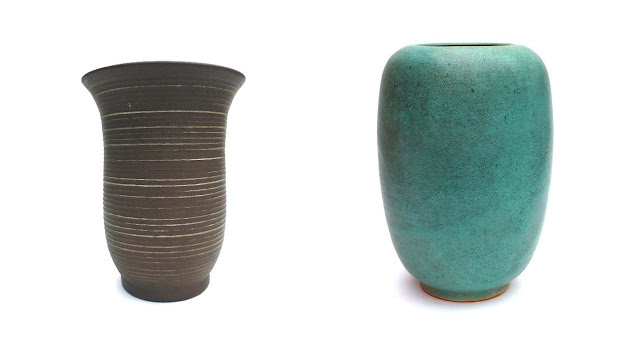 The perfection of the lines of vase 333 (above, left), reminiscent of ancient ritual vessels, is enhanced by the rich and subtle metallic glaze by Otto Gerhaz. The fact that it was slip cast does not make it any less interesting. Quite on the contrary; its form calls for that perfection that could not have been achieved by hand-throwing. The vase embodies a perfect congruence between the requirements of form/design (and its resulting lightness) and the technology used to implement it. In the two examples (above) by Schaffenacker (left) and Tirschenreuth (right) the technology of slip casting echoes the tectonic 'press-moulding' of the subject. The juxtaposition (below) of a hand-thrown ‘studio’ pot by Rudi Stahl with a slip cast krug vase by Ruscha Keramik highlights their distinctive and discrete aesthetic materialities; demonstrating that ‘studio’ and ‘industrial’ modes of production can both generate ceramic works of quality; if the design is good, if the manufacturing processes and if the technologies are skilfully and appropriately applied; capitalizing on their aesthetic potential. 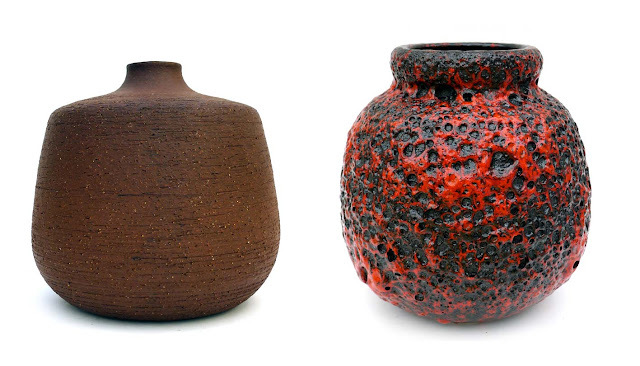 Left: Rudi Stahl, Hand-thrown stoneware (1960s) . Right: Ruscha, Vase 315 (1954-). The austere, introspective quality of Rudi Stahl's stoneware vase, on the left (1950s-60s) — inspired by the traditional undecorated stonewares from the Westerwälder region (where Stahl set up his studio, in the ceramic centre of Höhr-Grenzhausen), and, perhaps also, by traditional Japanese stoneware — its earthy matt glaze and the concentric lines left by the hand, as it shaped the clay on the potter’s wheel, contrast with the lighter, streamlined body of vase ‘315’, with its flowing/flamboyant handle, its striking red craquelé glaze, with black matt occlusions, which break the uniformity of its shiny surface. Neither vase is demeaned by the 'confrontation'. Both hold their own aesthetic ground. Whether we prefer one over the other does not reflect on the vases themselves, but is a matter of personal taste, and should be acknowledged as such. Pol Chambost (France), 1950s. Irene Pasinsky (USA). Scheurich, Vase 244-17, in three glaze variations. 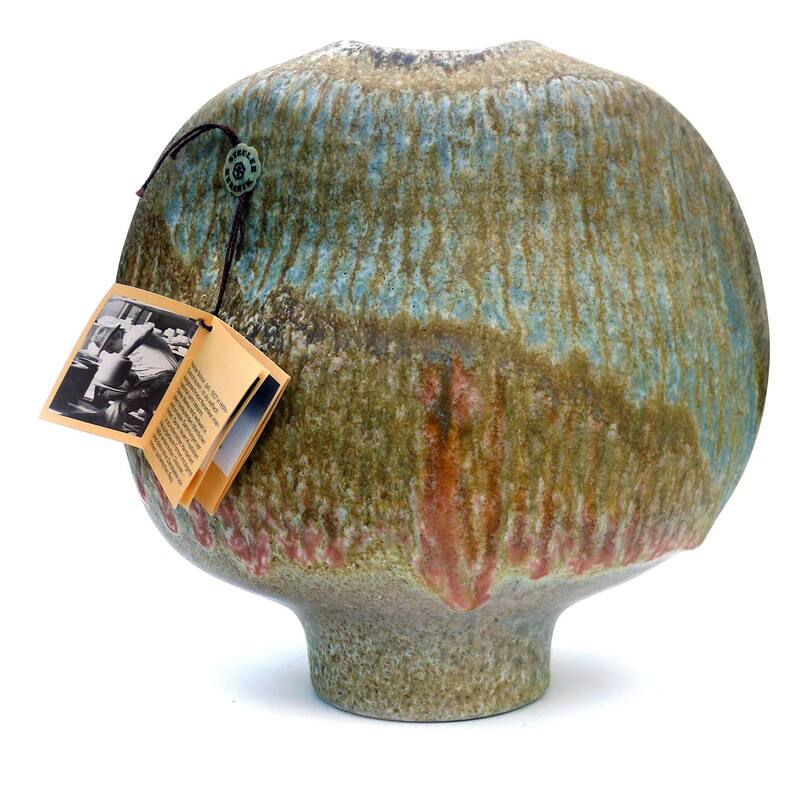 Although the form of the vase was designed i 1959, the introduction of lava glazes has not yet been established. 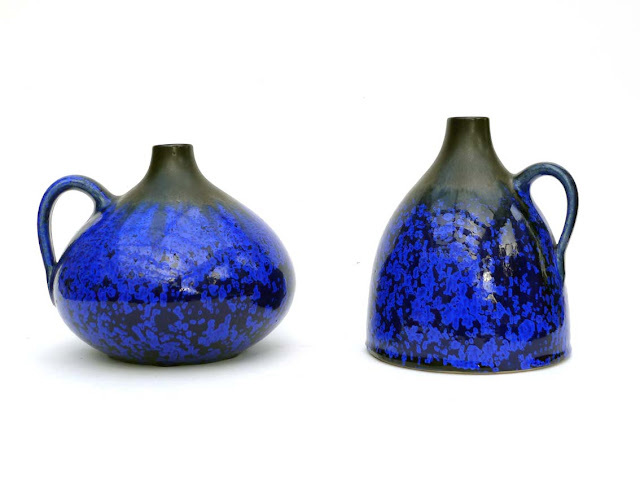 The capacity of glazes to transform form is evident in the following juxtapposition of two identical vases by Gerda Keuckeroth from c. 1962-64. Gerda Heuckeroth. Two vases for Carstens 'Atelier' series. Marked 'C 236-20' (1962-64). Albert Kiessling. Three vases decorated with snakeskin glazes. 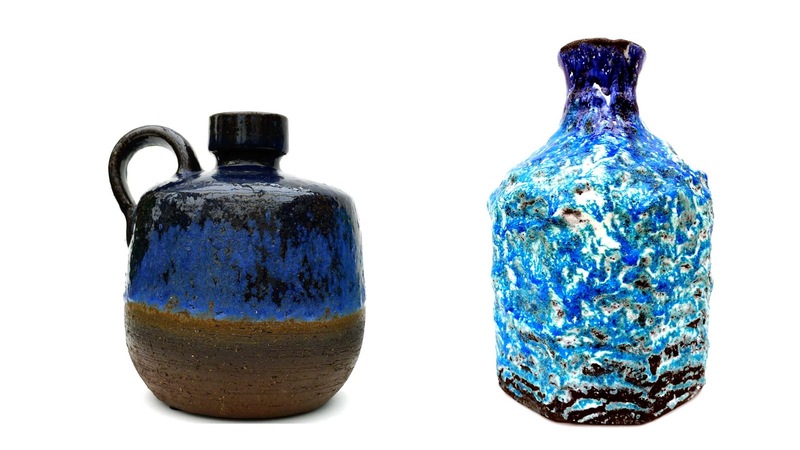 Due to their commercial availability, blue crystalline glazes (developed, among others, by Grès de Pierrefonds in France, from around 1910) occur in the work of several potters: Kierstin Unterstab and Walter Gebauer (who also published a textbook about the subject in 1985). 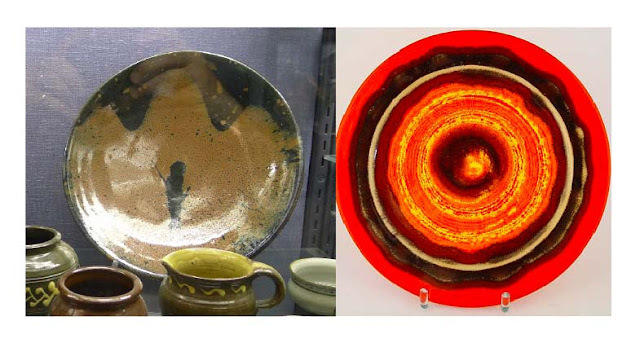 Throughout the 60s and 70s, experiments with glazes continued in Germany, with the adoption of lava glazes by several manufacturers. 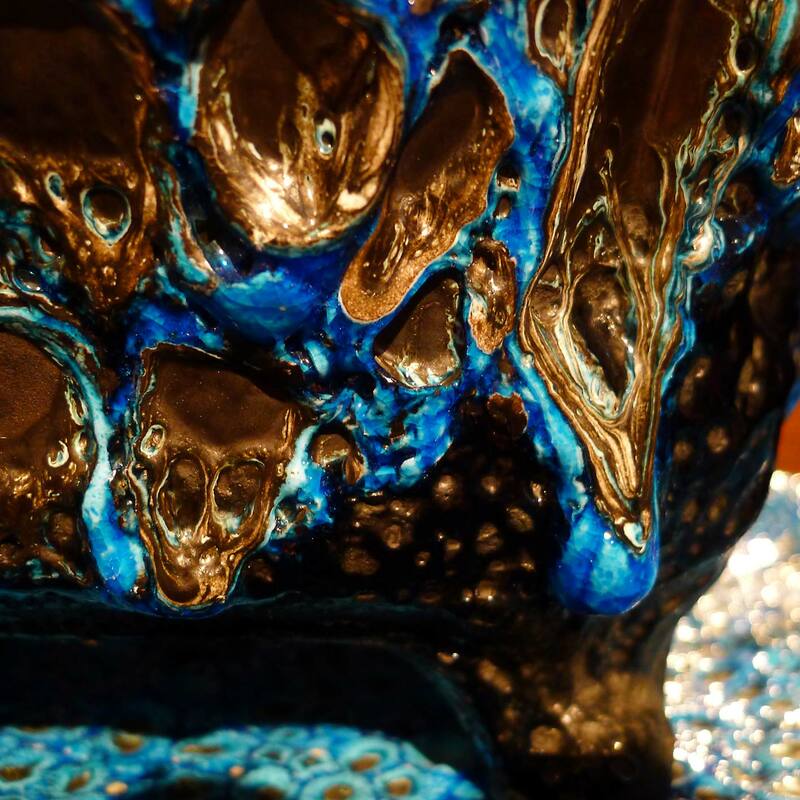 It is important to note that the most spectacular lava glazes were produced in factories, not in studios; by manufacturers who had the technologies, man power and the financial resources to invest in research and experimentation. Responding to the exhortation of critics, in trade magazines, to produce more modern wares. It is ironical that a writer who exorted German companies to take more risks, later complained that some manufacturers had gone too far! [personal communication from Ralf Schumann]. The author may have had the lava glazes produced by Marei, in mind (till recently attributed to Roth Keramik). 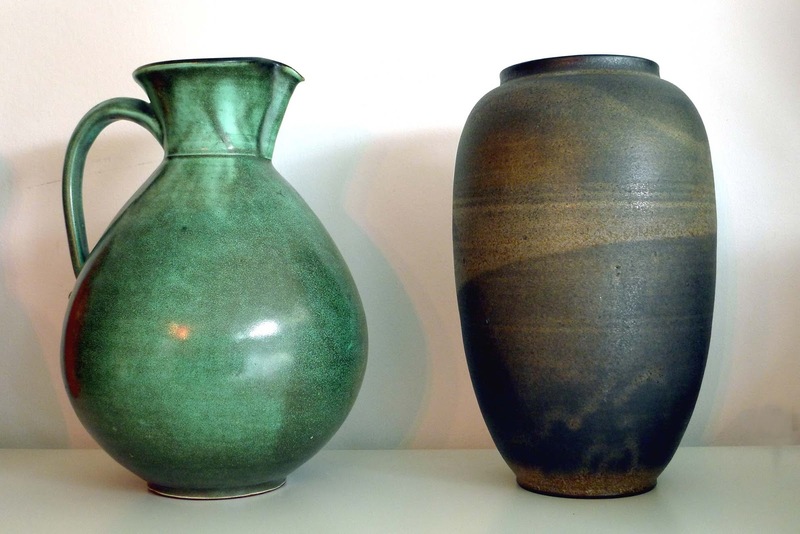 Left: Rudi Stahl, Vase. Hand-thrown partly glazed stoneware. Right: Marei .Vase. Moulded stoneware. Decor 'Capri', 1967, as shown on decor pictures from the Marei company'. Courtesy Ralf Schumann and Volker Hornbostel. Since, in order to be economically viable, ceramic works had to be produced in series, control over technical processes was essential. The challenge, however, was to prevent the works from looking too formulaic, standardized or banal. The fact that a substantial proportion do, suggests that it may not have been perceived — by manufacturers and by customers — as a problem, and was accepted as a necessary consequence of batch production and keeping prices low. Today, the task, for the discerning collector, is to find pieces that stands out — as the result of skilfull glaze application, a happy firing accident, glaze run, etc. — among the mass of formulaic products that came off the production line. Tea bowl. Japan, 16th century. 'Narumi-Yaki, 16th century. Narumi-Town, Nagoya-city, Aichi-Prefecture. However, given the industrial mode of production, a good design and the application of craft skills at all stages of the making process — especially glazing — could, and did produce works of artistic quality, even with standardised forms and glazes (the aleatoric nature of the glazing process meant that no two pots could ever be the same). The firm Marei, who are now making flower pots, are exemplary of how a fine balance between innovative designs, good craftsmanship and creative use of technology could produce ceramic works of lasting decorative interest; alongside other banal products manufactured for purely commercial reasons and to satisfy all tastes. 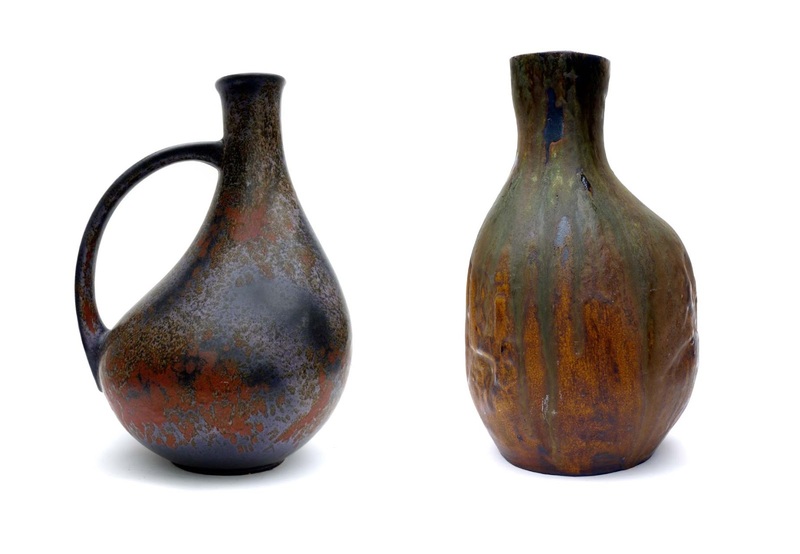 Following recent attribution of works previously believed to have been manufactured by Roth Keramik, it would seem that, at least from 1967 (with their 'Capri' glaze), Marei produced an outstanding (perhaps the best) range of lava glazes. For this reason they feature prominently in the exhibition — alongside Roth, Fohr, Jopeko, Scheurich, and others — with over fourteen vases. 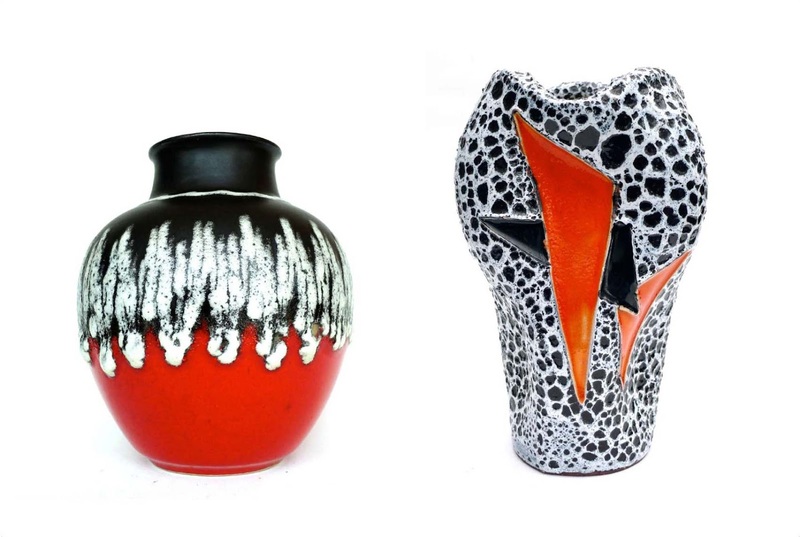 Take a vase of simple, timeless form (preferably with a handle), apply a coat of bright, colorful glaze (red, orange, yellow); next, apply a layer of clear shiny glaze; then a thick matt black volcanic glaze to the top of the vase (allowing it to run on the neck but not lower than the shoulder), to emphasize the contrast between bright, shiny color and thick matt lava textures. 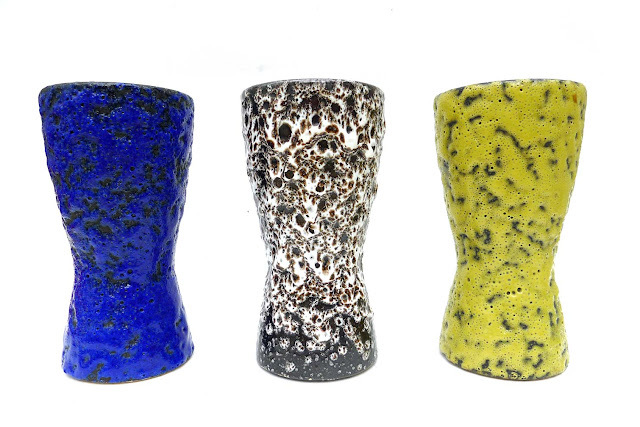 Comparing different versions of the same design one can evaluate the skills of the glazier and the glaze chemist involved in the production of these items. A batch was also produced in which a clear glaze was applied on top of the black volcanic glaze, giving it a more unified (but also more uniform, standardised) feel. This latter recipee was also used by Jopeko, Fohr and other manufacturers. 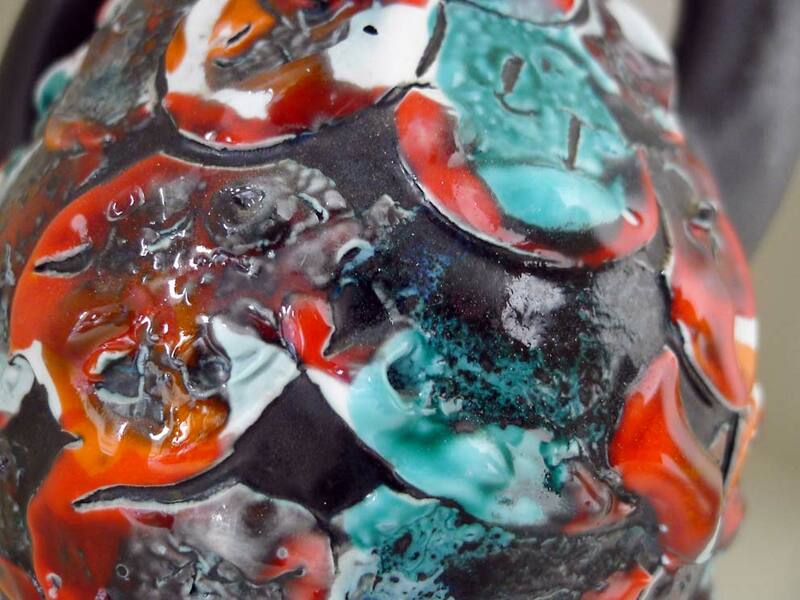 or first apply a thick, dark slip, cover it with a thick bright, colorful glaze (blue/white, orange, orange-red) that will run on the body of the vase covering most or all of it; absorbing some of the black layer and letting show parts of it as clusters. Given the complex, aleatoric nature of the processes involved, it was more difficult to control them, and required the input of a skilfull glazier to implement the desired effects. 1. These ceramics were made as decorative objects for the home, not as existential or grand aesthetic personal statements. 2. They were and remain outward rather than inward looking, and should be treated accordingly, as decorative (design) objects for the home. 3. They had to be produced in large numbers, simplifying manufacturing processes to reduce the cost of production to make it economically viable. This involved making compromises. For comparison, the work of studio potters Rudy Stahl, the Kubicek and Gerhard Liebenthron illustrate how, during the 50s, 60s and 70s, the local stoneware tradition was re-interpreted in a modern vein, in parallel with the industrially-produced 'Fat Lava'. The enigmatic firm Hoy Keramik, whose hand-thrown stoneware vessels were decorated with the brightest blue, yellow, red, green, orange and brown glazes — and became known for the cult matt, blue glaze, inspired by Yves Klein's 'International Klein Blue' — achieved a synthesis between rural and antiquarian (archaeological) forms; combining them simply and to great effect with bright, urban industrial glazes which gave them an air of modernity. Their success, aesthetically, rested in having simplified production processes without sacrificing quality, and in having harmoniously integrated craft processes (they retained hand-throwing for all their pieces) with the requirements of serial production. During the late 40s, the small pottery town of Vallauris, in the South of France — which had, for centuries, produced cooking pots [see section 4: Vallauris) and other domestic wares in 'terres vernissées' — underwent a renaissance. Thanks to the presence of artists like Picasso, Miro, Cocteau, Magnelli, Pignon, etc., potters and pottery enthusiasts came to Vallauris from different parts of France, to reinvent themselves as 'artist-potters'. Left: Vase, La Poterie Provençale, Biot. Right: vase. Unidentified maker. The modern interpretation of a traditional vase in 'terre vernissée' (above left), by La Poterie Provençale in Biot, and the neo-baroque sculptural vase decorated with a motif of the sun (right) highlight the Mediterranean spirit in which this revival took place — between tradition and the figurative modernity embodied by the works of Cocteau, Léger, Miro and Picasso. One significant contribution of Vallauris to postwar popular ceramics was the development of the 'écume de mer' glaze; a thick, rich, textured blue and white glaze named after the froth on the waves as they break and die onto the sand. It is not clear who invented it; and it is not a subject discussed in books about Vallauris. 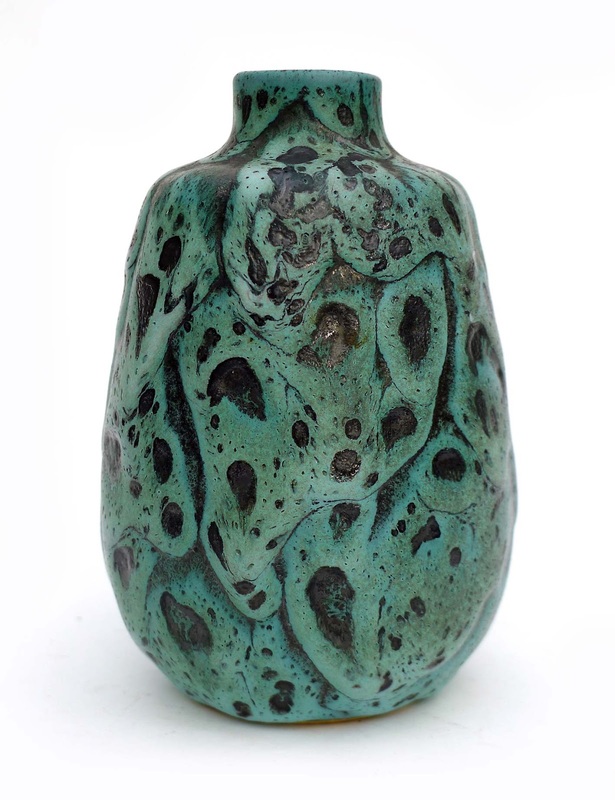 Louis Giraud produced thick dark lava glazes perhaps as early as the 50s, but the origin of 'écume de mer', used by Faddy (who identified his work with a sticky label) on hand-thrown and on slip-cast vases, remains a mystery. Modelled and carved like a sculpture, this vase was actually cast from a mould, in an unidentified factory (perhaps Le Vaucour). Made and retailed as giftware, it made modernity widely affordable across the country through gift shops. Although the sculptural form ('forme libre') and the spectacular glaze stand out, little is known about the workshop and Le Vacuous himself. The workshop produced a number of variation on this theme. Five are included in the exhibition. Unfortunately, current writers on Vallauris ceramics tend to dismiss these works as kitsch, in a rather elitist way, and have so far avoided researching their makers. Note the difference between the classical form of the Vallauris vase (expression of its Mediterranean legacy?) and the geometric industrial form and more restrained flow of the glaze on the Jopeko/Stein vase. In the form of the vases and, perhaps, in the lava flow itself, two cultural traditions manifest themselves: Mediterranean Classicism and Bauhaus Modernism. Giuge's show room in Vallauris. Note the candellabras on the table, on the right, which were often bought as a pair (as displayed). They were sometimes combined with a large fruit bowl decorated with the same glaze to make a spectacular display on a dining table or on a large dresser. Note how Giuge's, like many Vallauris potteries also used the more standard glazes which are synonymous with 'Vallauris' pottery. 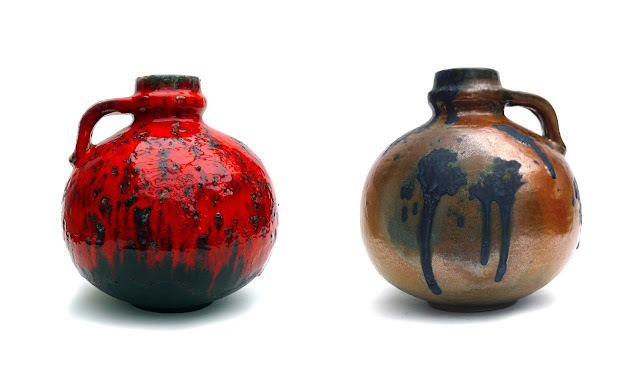 In the German vase below left, by Bay Keramik, 'fat lava' was sparingly used as a slip, calligraphically applied, onto a vase of conventional form, decorated with smooth, matt black and red glazes. Left: Rudi Stahl. Vase. Hand-thrown, unglazed stoneware (c.1960s). Right: Scheurich, vase ('284/19'), slipcast earthenware, with red and black lava glaze (c.1974). 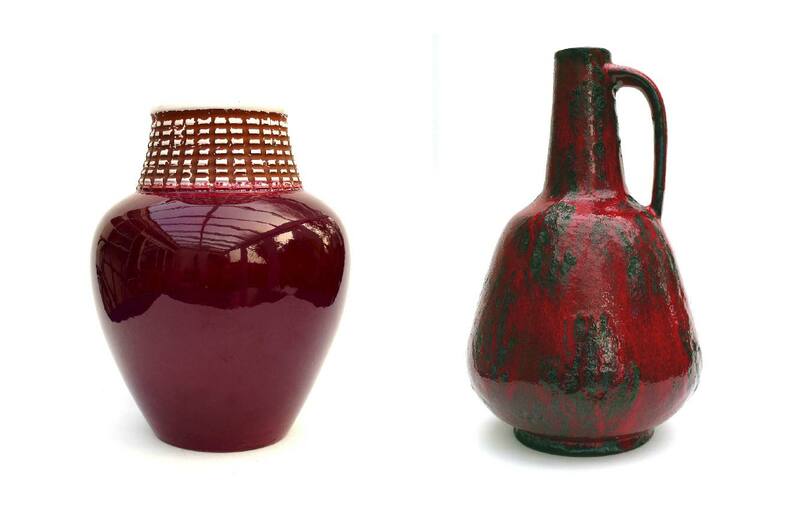 The heavily grogged, hand-thrown, unglazed stoneware vase by Rudy Stahl (left) exhudes a timeless beauty, and a synthesis of East and West; avoiding pastiche. The subtle ascending curves of the vase and its raw unadorned (ascetic) body confers upon it the Zen quality of an abstract sculpture — Brancusi-like — of metaphysical resonance. 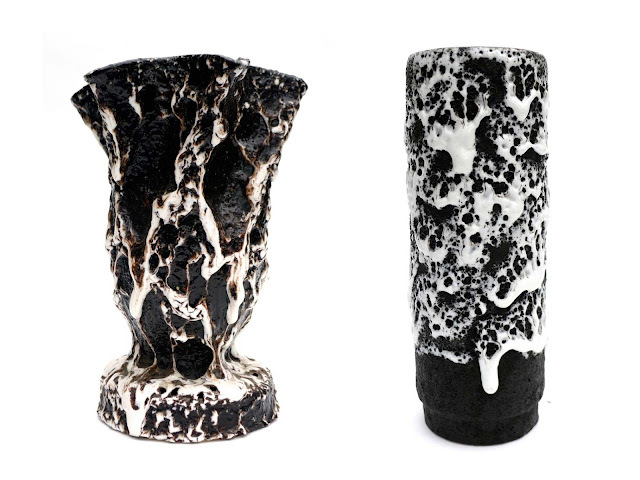 By contrast, the regular (moulded) contour of the Scheurich vase (form '284/19') is blurred and enhanced by the thick lava glaze, which brings it to life; placing it in a state of flux; as if it could melt and loose its form at any moment. Allusion/celebration of the fire that melted its surface? The juxtapposition of these two aesthetically very different vases creates a polarity. The point, here, is not to emphasise that one was made in a studio and the other in a factory, but to highlight that, through their distinct materialities and form/design qualities, and through their respective modes of production, they express two different aesthetics, which, in this context, can trigger a spiritual dialogue, transcending their function as vases. The chance encounter with a set of blue cratered plates from the Cyclope Pottery in Annecy planted the seed of this project by focusing my attention on lava-type glazes produced during the 50s, 60s and 70s, in France and Germany, in studios and factories, in what seemed a deliberate move to introduce a new Modernity into the home, through ceramics. Unlike in Britain, where the ceramic revival instigated by Bernard Leach advocated making traditional pots in a neo-rural, revivalist spirit — using archaic modes of production — in Germany the democratic impulse promoted by the Bauhaus inspired many studio potters and manufacturers to produce modern, affordable and economically viable ceramics for every day use. This process lasted till the competition from cheaper products (ironically manufactured in the Far East), combined with lack of discrimination from the buying public, led to an irreversible lowering of standards followed by closures. The exhibition 'Keramic Conversations' (and the accompanying blog) explores QUALITY in ceramics on a wider aesthetic basis than is adopted by museums and galleries, and in published accounts of 2oth century ceramic history; and challenges the dualism 'craft' vs 'machine', inherited from William Morris and the Arts and Craft Movement. The works in the exhibition represents a small proportion of (the tip of the iceberg) and a critical choice from the mass of works that was actually produced: from 'avant-garde' to conventional and cheap tourist 'tat'. Challenging conventional aesthetic hierarchies, Keramic Conversations proposes a re-appraisal of ceramic works on the basis of their aesthetic materiality, rather than through unquestioned assumptions about what is currently regarded as good or significant. The exhibition is structured around a series of 'conversations' between ceramic objects, in preference to conventionally 'showcasing' the works in isolation from each other (according to conventional typologies), to instate a polylogue, inviting us to ask the question: ' What are we looking at?' ; without preconception; and work out the answers for ourselves… on the basis of direct encounters with the objects; set in provocative juxtappositions for the occasion. The exhibition pays homage to those collectors turned e-bay sellers who scouted the field, bought and made these unknown ceramics available and generously share information on forums; and to the authors who researched the subject: M.P. Thomas, Horst Makus, K.J. Graham, Mark Hill (for WGP) Jean-Pierre Martin and Anne Lajoix (for Vallauris), and others, who guided me on this journey and, without whom the exhibition would not have been possible. A hearty thanks to you all. This on-going, on-line publication is offered as a free resource for collectors and as a contribution to the on-going debate about 20th century ceramics: a ploughing back of what I am learning on the way. My special thanks to Ralf Schumann who generously shared information during the preparation of a new book about Marei, with Volker Hornbostel. The question of 'WHAT IS A VASE?' underpins the exhibition and may challenge our sense of familiarity with the objects we know as 'vases', within the comfort of our personal tastes. The different reconfigurations of foot, body, neck, etc. in this or that vessel may help us appreciate the artistic interventions of the potters and designers, and provide a more cobcrete basis for appreciating their originality? A productive approach could also involve looking at the objects in the exhibition and infer, from their design and their materiality, the choices which led to their shapes, forms and decorations. In the absence of precise information about the dates of production of the various lava glazes, we are free to imagine some of the aesthetic choices, as they can be inferred from the materiality of the objects themselves.